Home » Mid Century Culture » postwar culture » We’re in the New York Times today! We’re in the New York Times today! Look who is in the New York Times today — it’s a story all about intrepid Retro Renovators. Yes, a story on the front page of the Thursday Home & Garden section all about the blog also quoting Cindy, Stephan and Helen (pictured in my montage, right) as well as Judi, Jason — and yes, Chippy of World of Tile, too. My gosh. Thanks to EVERYONE on the blog who helps make this the wonderful community it is! xoxo I have to run out the door to buy some copies of the paper from Loeb’s right now. 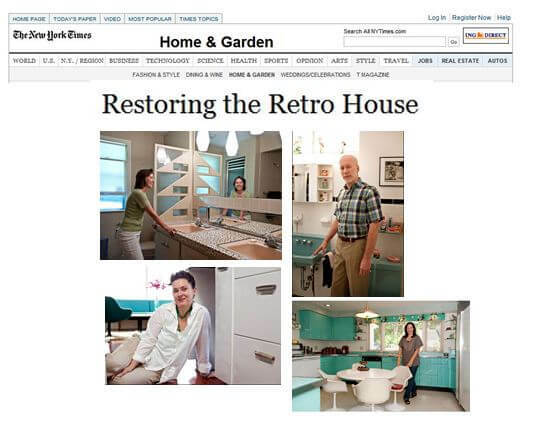 Meanwhile — check The New York Times story, “Restoring the Retro House”, out online! Thank you, Nina462, glad to have you with us all this time! Wonderful, well deserved recognition for you and the cause, Pam. Thanks for all you do and for being my paragon, as always. Thank you, Annie B. You, too, a longtimer! Congratulations Pam well deserved recognition for the cause, group, website and of course your efforts.